For Harry Potter fans, a trip to Universal Orlando Resort is tops on their list of vacation destinations. Potterheads have been wowed by the immersive theming of the Wizarding World of Harry Potter, which spans Universal Orlando's two theme parks. It includes Hogsmeade at the Islands of Adventure and Diagon Alley at Universal Studios Florida. 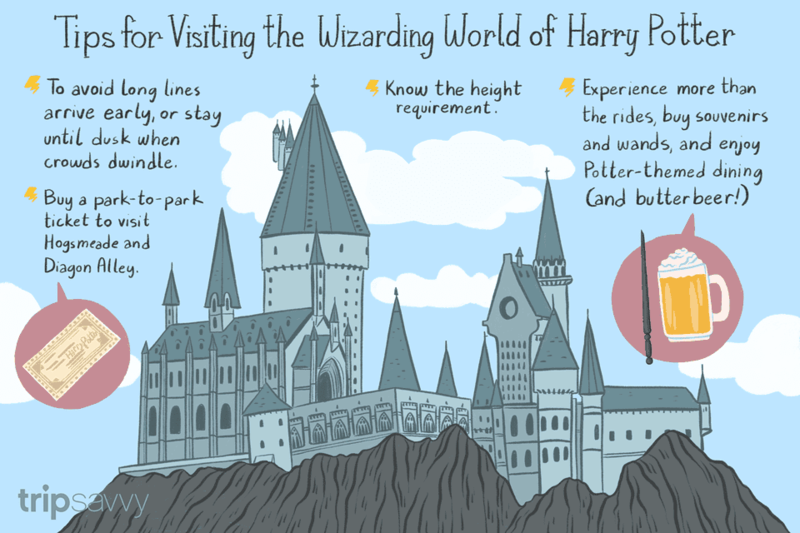 You must by a Park-to-Park ticket to be able to visit both parts of the Wizarding World of Harry Potter. Guests can travel between the two areas on the Hogwarts Express, a full-scale replica of the train that appears in the film series. At Islands of Adventure, Hogwarts Castle towers over Hogsmeade village, and inside the castle is the Harry Potter and the Forbidden Journey ride. You can also ride the Dragon Challenge dual roller coaster and the small-but-fun Flight of the Hippogriff. You can buy chocolate frogs in Honeydukes, or robes in Dervish and Banges. At Universal Studios, a section of Potter's London has been recreated in Diagon Alley, an impeccably detailed street featuring shops, dining experiences, and a marquee ride called Harry Potter and the Escape from Gringotts. Try really hard to be at the theme park when it opens. Lines get longer as the day wears on, so first thing in the morning is your very best chance of riding the marquee rides (Escape from Gringotts and Forbidden Journey) with little-to-no wait times. To get the earliest start possible, consider staying in one of the excellent Universal Orlando resorts. On many days, guests at these resorts get early admittance to one or both parks. In late August, for example, this means visitors enter Islands of Adventure at 8 a.m. and start enjoying the park when it is virtually empty. Much of the Wizarding World is made up of shops, dining, and a lot of really fun, immersive Potter theming. The two marquee Harry Potter rides are incredible, but you'll save yourself time and possibly your children's tears if you know the height requirements for the rides before you go. People really disappear through Platform 9 3/4. If you're taking the Hogwarts Express from King's Cross Station, it's easy to miss one of the coolest special effects if you don't know where to look. Stand a bit back from the entrance to the tunnel leading to the train. The people in line ahead will appear to pass through a solid brick wall to Platform 9 3/4. Note that you can't see the effect as you walk through the tunnel, but those in line behind you will see it. There's a magic phone booth outside the train station. The red phone box outside of King's Cross Station makes for a great photo op, but few tourists will actually try to use the phone. If you dial MAGIC (62442), you'll be patched through to the Ministry of Magic. Arriving early is your best bet to avoid lines for at least the first hour in the morning. But as the day progresses, crowds get bigger and lines get longer. Another strategy is to visit Universal Orlando during one of the less crowded times of the year. The Universal Express pass is now accepted for Harry Potter rides. You can skip the regular lines at most of your favorite rides and attractions, including both lands of The Wizarding World of Harry Potter. The regular line can be quite long (especially later in the day). But there are a few ways you might shorten your wait time. Look for single-rider lines, which move quickly. Note that you may not be able to ride with family members, so this is a better option if you have older kids. Also, at Forbidden Journey, you may miss the pre-ride tour of Hogwarts Castle, which is a highlight. This brings up a key point about the line for the Forbidden Journey: once inside the castle, the line is an enjoyable experience as it's essentially a tour of Hogwarts with fun details such as talking portraits, special-effects appearances by Dumbledore and other characters, and a filmed introduction to the ride that features Harry, Ron, and Hermione. Long lines may also occur for the Dragon Challenge coasters, popular rides where guests can use the Universal Express Pass skip to the front of the line. Many Harry Potter fans rush to Ollivander's to buy a wand, only to find a long line simply to enter the shop. This line leads to a one-person live performance inside the small shop where only a few dozen people at a time can fit, hence the slow-moving queue. Ollivanders is a beautifully themed little shop, in which a costumed keeper picks one child from the audience for wand selection. A nice little performance ensues, as the wand chooses the child, not the reverse. This is a well-done vignette, but wait times can be lengthy. If your time is limited, ask yourself whether this is a must-do. You can also buy wands from carts positioned outside Hogwarts Castle and in Diagon Alley or, to save even more time, you can buy interactive wands online from the Universal store before leaving home. Note, however, that all of these shops are small and can get very crowded. For an alternative, try shopping at Filch's Emporium of Confiscated Goods, in the lower regions of Hogwarts Castle: a much bigger store with some different merchandise. Some Harry Potter merchandise is also available at the large Port of Entry shop near the entrance/exit for Islands of Adventure; however, not all items can be bought there. Wands, for instance, are only available in the Harry Potter theme park itself. There are several places to eat in the Wizarding World of Harry Potter. In Hogsmeade, The Three Broomsticks is a rustic English tavern where you can sample signature drinks—butterbeer, pumpkin juice, pear cider—along with a special Potter-themed menu including fish and chips, shepherd's pie, soup, salads, plus desserts such as apple pie and chocolate trifle. There's also a children's menu with favorites such as mac and cheese, fish and chips, and chicken fingers. Also inside the Three Broomsticks is Hogs Head, where grownups can try a special Harry Potter alcoholic brew. The outdoor eating area behind The Three Broomsticks is a quieter area to rest and sit down for a little bit. If some members of your party want to ride coasters, others can relax in this area which can be reached without walking through the restaurant. In Diagon Alley, the Leaky Cauldron is a quaint pub serving a menu of traditional British food including cottage pie, fish and chips, and bangers and mash, in addition to butterbeer and other signature drinks. There's also a children's menu with staples such as chicken fingers and mac and cheese. Also in Diagon Alley, you can pop into Florean Fortescue's Ice-Cream Parlour for scoops or soft-serve ice cream in flavors that run the gamut from the usual to the interesting. In the morning hours, Continental breakfast items and pastries are available along with bottled pumpkin juice, teas, and water. Still, the 8 p.m. closing will give you the chance to be in the Harry Potter theme park area at dusk. The crowds dwindle a bit and your children can ride the Dragon Challenge Coasters umpteen times in a row, and shops like Honeydukes look inviting, with lights on inside, and are less crowded. Meanwhile, Hogwarts Castle, looming high on its perch and illuminated within, looks nothing short of magical.